International ITMO University Master’s Programs are taught in English and offered in collaboration with the world’s leading universities. Go to the application page, create an account, complete the form and submit your application. Please use your official name, the same as the name in your passport and on all your application documents. Make sure your email address is valid as all ITMO University correspondence will be sent to the email address you enter in the Application Form. Your application must be submitted by the deadline. Application deadlines may differ from one Master's Program to another. Please check your chosen program’s deadline on the corresponding page. For the 2018 – 2019 academic year, the deadline is 1 July 2018. The following components of application must be submitted. 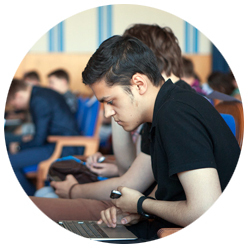 Check the e-mail address submitted in the application regularly to get the Acceptance Letter from ITMO University. It may take up to three weeks after the submission deadline to receive this email. To enter Russian Federation, international visitors are required to have the proper visa stamp in their passports. Citizens of some countries do not require a visa to enter the Russian Federation, but in most cases the duration of their stay in Russia is limited. Contact the Russian consulate in your home country to check visa requirements. Visas are obtained at a Russian embassy or consulate abroad. Visas cannot be obtained within Russia, because it is an "entry" document to the country . ITMO University provides the successful applicants with the official Invitation Letter by Federal Migration Service. This document is sent by express mail to the address provided in the application form. You can obtain an entry visa for 90 days at a Russian embassy or consulate with the Invitation Letter and documents listed in Step 4. The period of your visa will be extended after signing a contract with ITMO University for the period of your education. Upon your arrival you must get migration registration at the place of you are staying in the Russian Federation. ITMO University provides all applicants with full support and with registration once you are in Russia. Students are responsible for tuition fee, round-trip airfare ticket, dormitory, living expenses, health insurance. Tuition fees are calculated based on the cost of your program and housing and availability of grants and scholarships. ITMO University is committed to providing available grants and scholarships to all admitted students (regardless of citizenship) who have requested them during the application process. Please, check availability and conditions of grants and scholarships on the chosen program page or by e-mail international@mail.ifmo.ru. Payment should be made upon signing your contract by credit card or in cash in the bank. Please, follow the link to see more information about life at ITMO. Your International Student Advisor will help you feel right at home: from housing at one of the dorms to buying metro passes to finding new friends, you’ll get settled in and be on your way to your great adventure!